St Anne's B&B, Painswick, is a former wool merchant’s house in the heart of Painswick with antiques, a log fire and relaxed family atmosphere. St Anne's has 3 double/twin rooms bedrooms decorated in a country house style. Prices are very good value at from £55 single or £75 double or twin including a delicious organic breakfast. Within strides of village pubs and restaurants. Ideal for weary Cotswold Way walkers, muddy boots, bikes and dogs welcome. Stunning circular walks also make us an ideal weekend place to stay. The famous Saturday Farmer's Market in Stroud 3.5miles. Explore Painswick: pretty winding streets, Art gallery, shops, Rococo Gardens and hill top Fort with views across the River Severn to Wales. You can book easily using our on-line booking service above. We use Freetobook which is safe and secure and easy to use. We especially welcome weary walkers & cyclists. 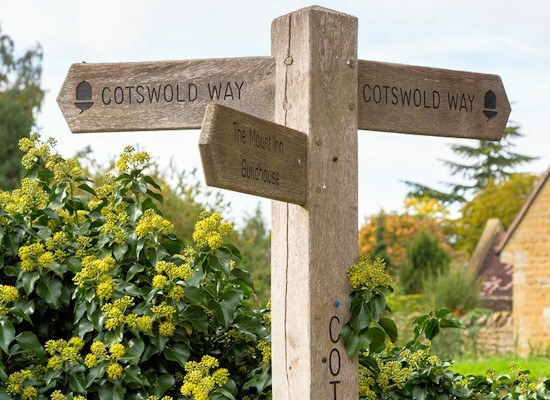 We are right on the Cotswold Way trail and very close to the Wysis Way and crucially only strides from good pubs & restaurants! If you stay for two nights, we can arrange to pick you up from the trail and drop you back the next day. We can also arrange luggage transfers, prepare delicious picnic lunches and have a place to dry wet clothes and kick off your muddy boots.